This week at Just Add Ink we have a really fun theme challenge (well all our challenges are always fun lol)! Jo has challenged us to use the colour combo of our favourite chocolate wrapper! Perfect especially for Easter. Guess what my favourite chocolate bar is? Yep A Nestle Milky Bar. Well I do like Cherry ripes too but milky bars have been my favourite since I was a small child and got pocket money! I went off it for awhile though as I made myself sick from eating 2 large blocks of Milky bar chocolate at the movies once. Not a great idea when you are 10! This card is for one of my card class ladies who is celebrating her 50th Wedding Anniversary this weekend with family. Happy Anniversary Gloria and Gary! The flower is the blossom party die which I have stamped with Wonderfully Worn background stamp which Ive just got. The other flower set is greenhouse garden which Ive just got as well as part of my Managers bonus for achieving that status. Gotta love free! You get $350 to spend on anything. 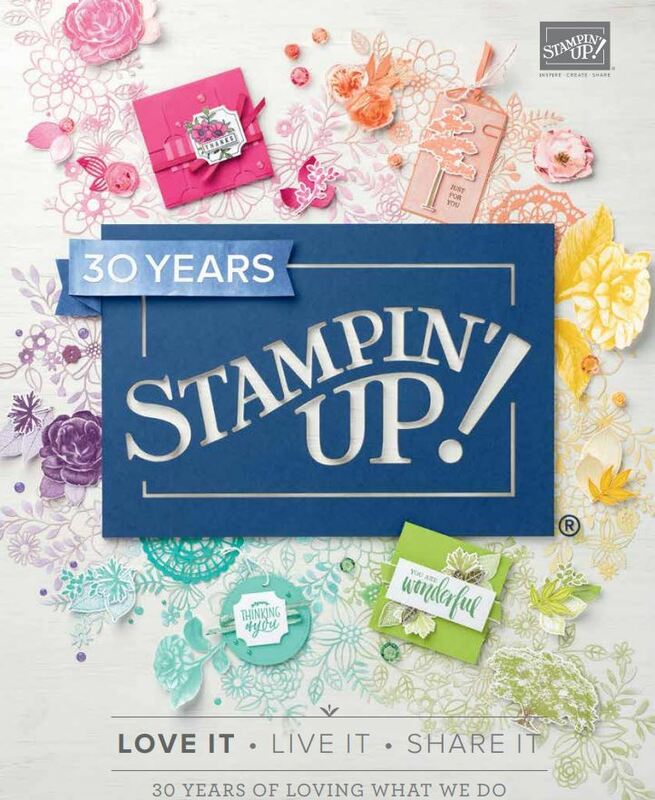 I spent it on two stamp sets and a Big shot for last months promotion.. The sentiment is from teeny tiny sentiments. You can see Ive used the mat pack on the inside and out. Mum says she likes this … if Im quick Im gonna steal the chocolate – matches me, white in all! Delys, this is DIVINE! Even more delicious than the chocolate bar, I reckon. 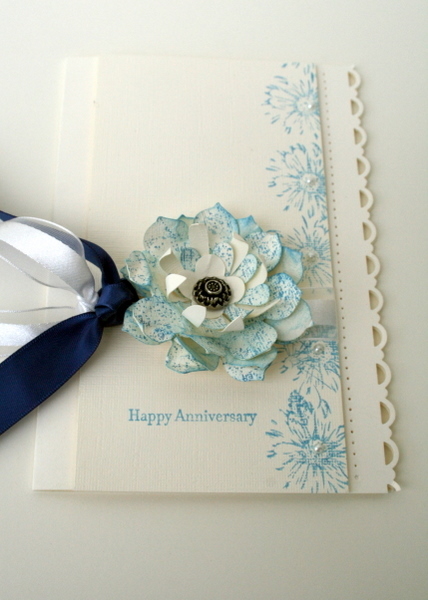 What a beautiful anniversary card. 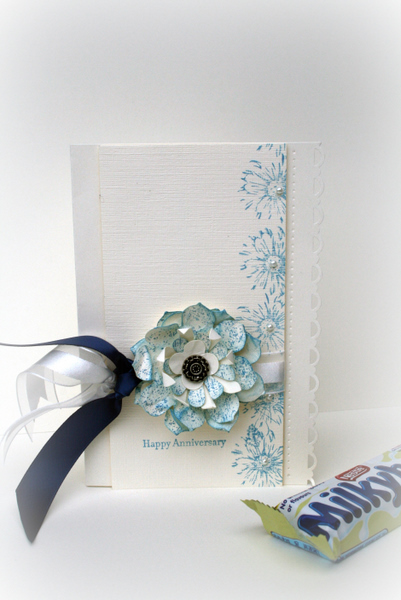 Delys this card is absolutely stunning…it is a melt in the mouth piece…and a beautiful anniversary card! I have popped it very quickly in my TO CASE file. This card gets an A+ from me!! Love the blue and white, the layout and how you have layered the ‘blossoms’ I haven’t had much of a play with that die but I’m about to!! I absolutely love this Delys! you have aced this one, the colours, layers and flower are devine. So glad l already have this set, will be casing this one for sure. Love your style of cards! This is such an elegant one! Your card is really beautiful Delys. I love the way you’ve done the edge, it’s so pretty. That flower looks fantastic too, I may have to buy that die. Ok I confess I do love a bit of milky way – just one little piece every now again – yummo! 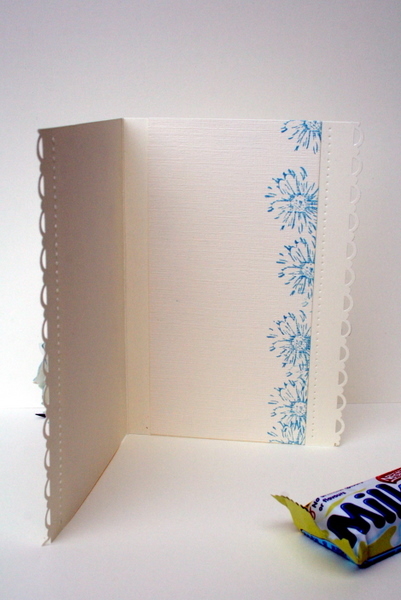 Love how delicate your card turned out and that flower border down the side – gorgeous!!! Such an elegant card Delys, and it suits Milky Bar perfectly. I do love a little Milky Bar myself now and then…hell it’s chocolate, I’m not picky lol. This is lovely Delys, love the gorgeous flower too. Such an elegant anniversary card Delys. Love your blossom, and all your ribbons too.